Known as the Mistake by the Lake, Cleveland Municipal Stadium, was one of football’s hallowed grounds for more than five decades. The idea for a new stadium in Cleveland was first mentioned in 1903. By the 1920s a 25,000 seat was proposed. However, Osborn Engineering designed a much bigger stadium that could house a variety of events. In 1928, a $2.5 million bond was issued by the city to build the stadium becoming the first stadium built using public money. A landfill full of old cars and tires near Lake Erie was chosen as the site to build the stadium on. Ground was broken for the stadium on June 24, 1930. Constructed of steel and concrete, the stadium became known as Lakefront Stadium. The stadium was completed by July 1, 1931 and the first event was held two days later. There was one problem after the stadium opened as it had no main tenant. The Cleveland Indians (MLB) were glad that a new stadium was built, but decided not to move into the stadium until 1932. Lakefront Stadium had a capacity of 78,189 that included covered double-decked grandstand that was in the shape of a horseshoe and had an uncovered section of bleachers beyond the endzone. There were 37,896 seats in the lower level, 29,380 seats in the upper level and 10,913 bleacher seats. The stadium also had lights, a sound system and a scoreboard behind the bleachers. In 1937, the Cleveland Rams were founded by Homer Marshman, a Cleveland attorney. The NFL placed the Cleveland Rams in the NFL Western Division to replace the St. Louis Gunners. The Rams began playing at Cleveland Stadium in the fall of 1937. For nine years the Rams played at Cleveland Stadium with the Cleveland Indians. After the 1945 season, owner of the Rams, Dan Reeves moved the team to Los Angeles. In 1944, the All-American Football Conference was born. Businessman, Mickey McBride was awarded a franchise that became known as the Cleveland Browns. 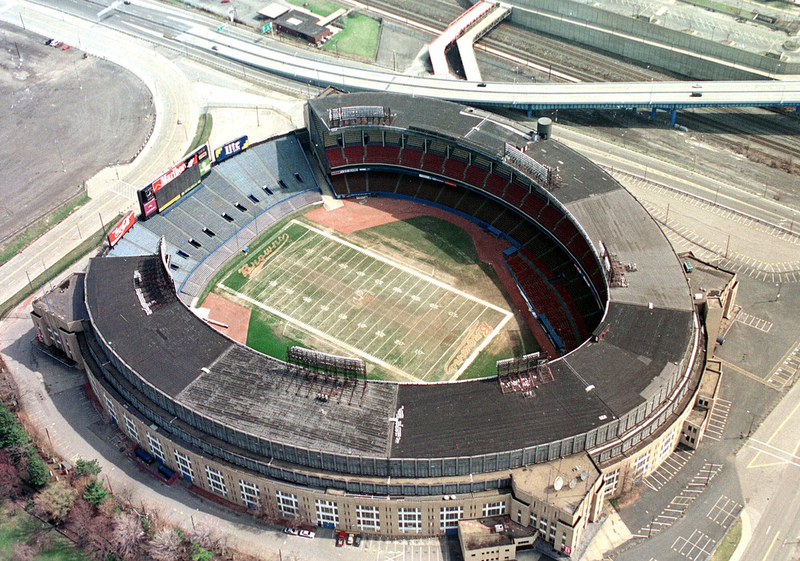 The Browns shared Municipal Stadium with the Rams for one year. Once the Rams left for Los Angeles, the Browns became the only football team at Municipal Stadium. Throughout their history at Municipal Stadium, the Browns were one of the best teams in the NFL. At Cleveland Municipal Stadium very few changes occurred. The stadium was renovated in 1967 and 1974 when the original wooden seats were replaced by plastic ones and a new scoreboard replaced the old one. Transformation of Municipal Stadium from football to baseball was relatively simple as few changes had to be made to the stadium in order for football to be played. The football field was laid out straight up the center of the baseball field. One of the more notable parts of Municipal Stadium was its rowdy fans who sat in the bleachers behind the end zone. This section became known as the “Dog Pound” where fans would hassle the opposing team. During the late 1980s and early 1990s, Cleveland Municipal Stadium began to deteriorate rapidly. The Indians moved into Jacobs Field after the 1993 season. After failing to reach an agreement to get a new stadium built for the Browns, owner Art Modell, moved the Browns to Baltimore after the 1995 season. 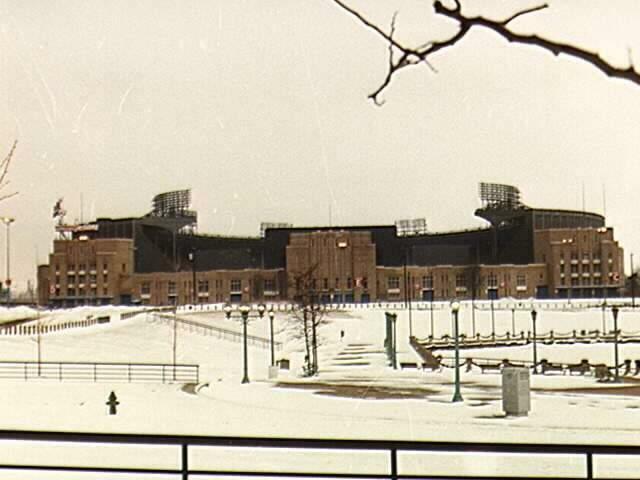 The Browns played their final game at Municipal Stadium on December 16, 1995. The stadium was demolished in November 1996. During the same year, the City of Cleveland and the NFL secured a deal to return professional football to the city by 1999. The city built a new stadium, FirstEnergy Stadium on the site where Cleveland Municipal Stadium was located. An expansion team was awarded to the city and the Browns began playing in Cleveland on September 12, 1999.